"Bp. Sun Dezhen with visiting bishops of Fenyang and Hongtong"
Group pictures of Bp. Sun Dezhen with visiting bishops of Fenyang and Hongtong, taken on the feast of St. Andrew. Front row left to right: Fr. Louis Chanet, CM, of Zhengding; Bp. Sun Dezhen, Bp. Francis Liou (Liu Jinfang 劉錦方) of Fenyang, Bp. 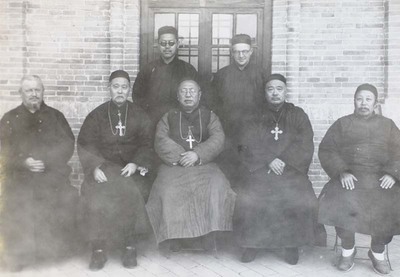 Peter Cheng (Cheng Yutang 成玉堂) of Hongtong; Second row: a Chinese priest, Fr. Raymond de Jaegher. Bp. Sun Dezhen with visiting bishops of Fenyang and Hongtong. November 30, 1933. Société des Auxiliaires des Missions (SAM) China Photograph Collection, Whitworth University Library, Spokane.